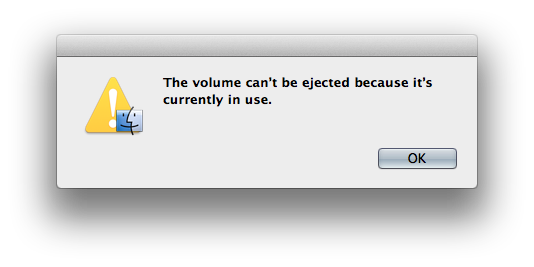 "The volume can't be ejected because it's currently in use." "The disk "Diskname" wasn't ejected because one or more programs may be using it.". "umount(/Volumes/Diskname): Resource busy -- try 'diskutil unmount'"
As far as I am aware, I am not using this disk but Finder says I do, so I must be wrong. I prefer a clean unmount of the drive. As I am in the middle of doing multiple tasks, logging out and logging in is not preferred as is the installation of third party software. Terminal command lsof might be of use here, but personally I think this is too complex for such a 'simple' problem and to be honest, I do not know how to use it properly. My question: How do I know what program is using my drive so I can properly quit that program and eject my drive? which gives you a list of open files on the disk. Have you tried $ diskutil unmount /Volumes/Diskname ? Or $ diskutil unmount force /Volumes/Diskname ? Due to the complex and interwoven nature of Mac OS X, umount may fail often. It is recommended that diskutil(1) (as in, "diskutil unmount /mnt") be used instead. Or use quotes to avoid confusion. $ diskutil unmount "/Volumes/Disk Name"
Your problem is probably caused by the process mds : Spotlight indexing your disk. I have this problem, and I have not found a solution (yet). You could try the donationware application "What's Keeping me?" 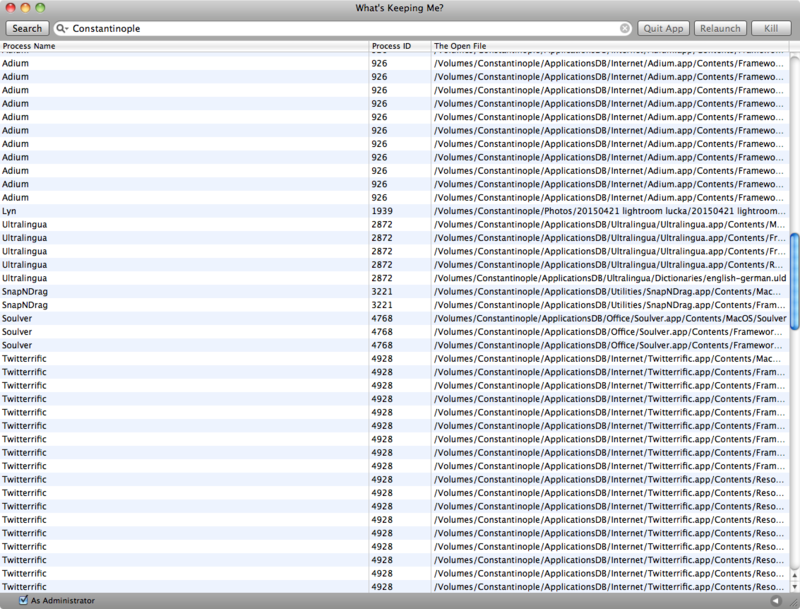 that shows what process/application is using the volume/folder/file. This program is certified by the developer for Mac OS X 10.6 Snow Leopard, but the RoaringApps page for this application lists it as working fine on OS X 10.7 Lion and OS X 10.8 Mountain Lion. 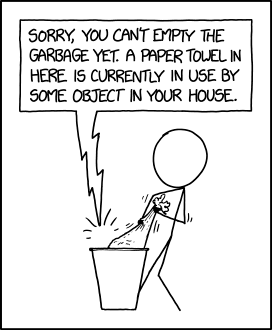 Have you ever have the problem where you can’t empty the Trash or eject a disk because something is preventing you? Usually the reason is because some application has a file open, and thus you can’t get rid of the disk or trash the file. That’s why we made What’s Keeping Me! What’s Keeping Me will identify the application that is holding the item open. You can then use What's Keeping Me to quit the problem application (or kill it if needed) so you can perform your task. What’s Keeping Me includes an Automator workflow so you can perform searches directly from the Finder too! I've had this message despite being sure there are no open files on the volume. I checked this with Why Not Unmount, a GUI tool that can indicate open files on a disk. In my case, it was a sign that the file system is corrupt. Running Disk Utility (or if that wasn't enough, DiskWarrior) solved the problem and made the disk ejectable again. fseventer is a great file system access monitoring utility for various purposes. It runs with super user permissions (sudo), so it sees all read/write access of all mounted file systems, and presents them in a very clear overview. My experience: I had a Volume which constantly could not be ejected properly (as in the OP's screenshots), and always needed a "force eject", sometimes even a forceful physical disconnection (nor recommended! could damage your filesystem(s) on that disk) or a system shutdown to bypass that brute method. Determine which file is accessed (with lsof or fseventer). In my case it was a Classic Mac OS file with a resource fork that remained open, likely as some background disk parsing process (Spotlight, QuickLook, or thelike) hung on it. Backup that troubling data into a file archive (which preserves (Classic) Mac specific resource data). 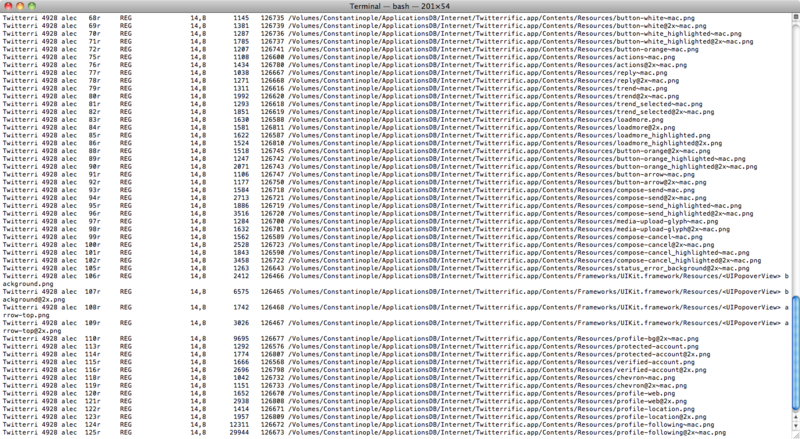 I simply used Finder's native "Compress" function from it's context menu. With Finder as usual. Likely this will fail, as it's a "troubled file/folder". With Finder plus holding down ALT while emptying the Trash. This creates a little more force, but likely it will still fail. Through the Terminal with sudo rm -R /path/to/troublesome/FileOrFolder. This eventually worked after Finder's delete attempts have failed. Try unmounting the volume again. It may still fail, as the background processes, which failed, could be still in a irrecoverable state. Restart. Then try unmounting again. From then forth the Volume worked fine again. Normal mounting, unmounting, read/write operations. Only when a file was indeed open by a user process, unmounting was prevented. Perfectly normal behaviour again. Both the command line solution and What's Keeping Me work great. The GUI application is What's Keeping Me, available at Hamsoft Engineering. Screenshots of both with the same search going on. I prefer the command line just slightly, as it's always there with you. On the other hand, What's Keeping Me is quicker and easier to use if you've got it installed. Solution Make sure all programs are closed. Click the Apple icon in the top left of the screen, then click Force Quit. In the list click Finder. Now click the Relaunch button. Then try ejecting the drive again. Not the answer you're looking for? Browse other questions tagged macos external-disk eject disk-volume . How do I make Spotlight stop indexing my Backup drive? Why does OS X require admin privileges to unmount a drive from the terminal using `umount` but not when using Finder? Can I configure my Macbook to unmount all external drives when I close the lid?